Have you lost, misplaced, or damaged you AICP certificate and/or lapel pin? No worries! APA will gladly replace either item for any AICP member. Use the order form linked below. You should receive your merchandise in 3–4 weeks. Display your commitment to ethics as a member of AICP. Print and frame this certificate to affirm the principles and standards you have pledged to uphold to colleagues, clients, and the public. 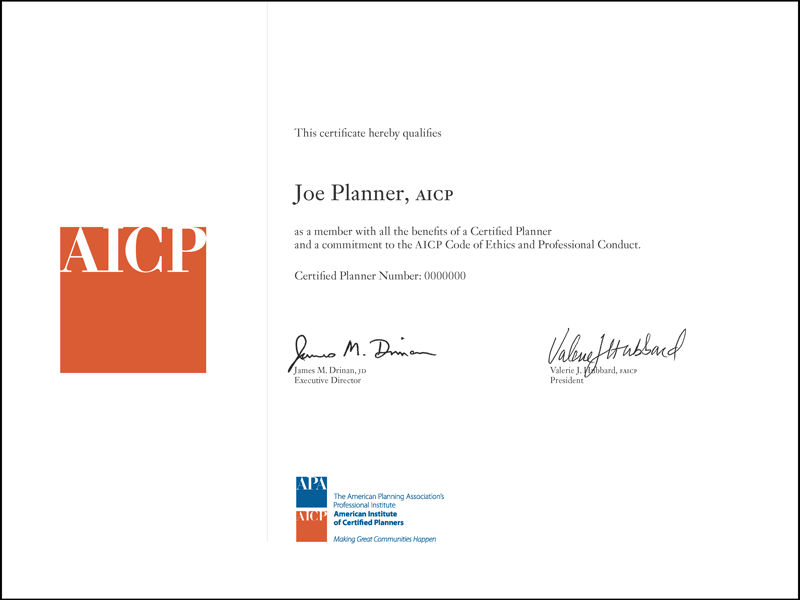 Whether you work in the public or private sector, your organization will benefit from hiring AICP-certified planners and encouraging certification maintenance. Use this leave-behind to articulate the value of certification to your peers and supervisor.